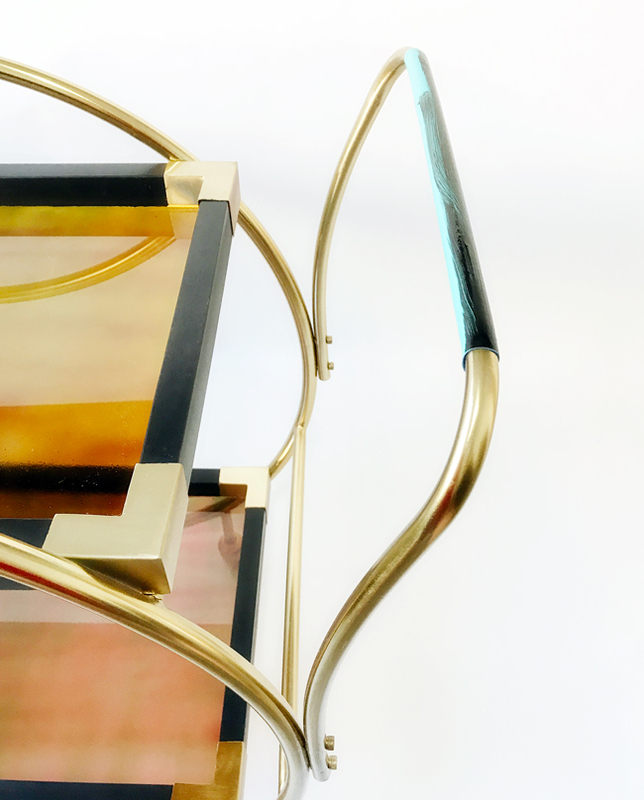 Finishing School is in session, my friends… and today we are covering some new finishes that are perfect to add to your finishing arsenal – stained glass, all-weather wood and even some leather. The fabulous thing about the main finish is that it will work on raw wood – or in other words – newly built furniture, if you catch my drift. If you want to dress up your glass inserts, I will show you a fantastic way to do it. 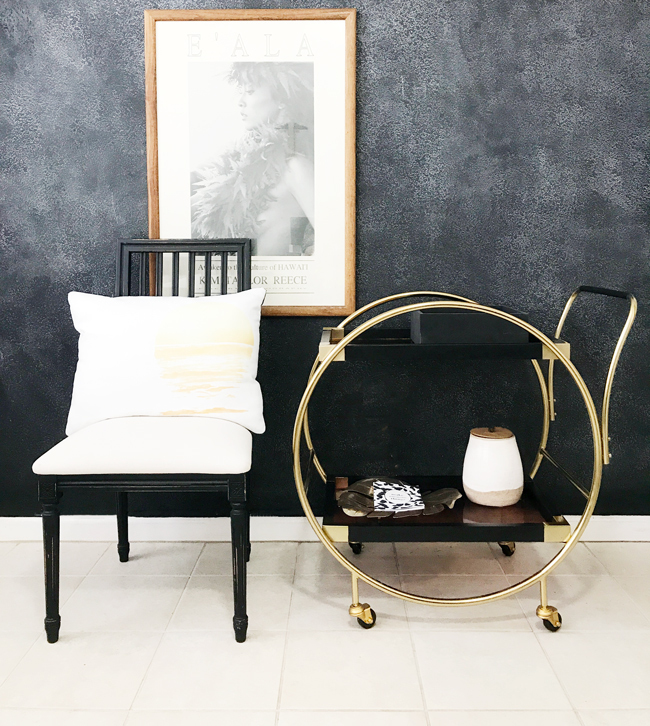 This month’s Michaels Makers Challenge is all about the world of craft paint. I thought it would be a great opportunity to give some of the ideas I have had, floating around in my little head, a bit of a whirl. 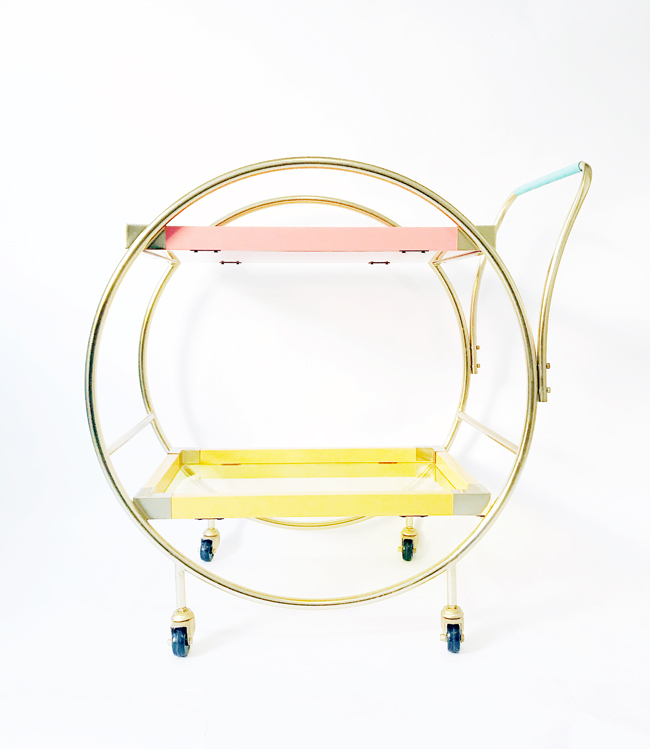 I am working with the super chic vintage bar cart from Oh Joy for Target, which is sadly not available any longer, but this one is a great option if you would like to put your unique spin an existing piece. Of course you can choose to build something from the ground up, as well, using any of my DIY furniture plans! As you can see, this bar cart is fantastic as-is, but a bit too colorful to work with my decor on a more permanent basis. 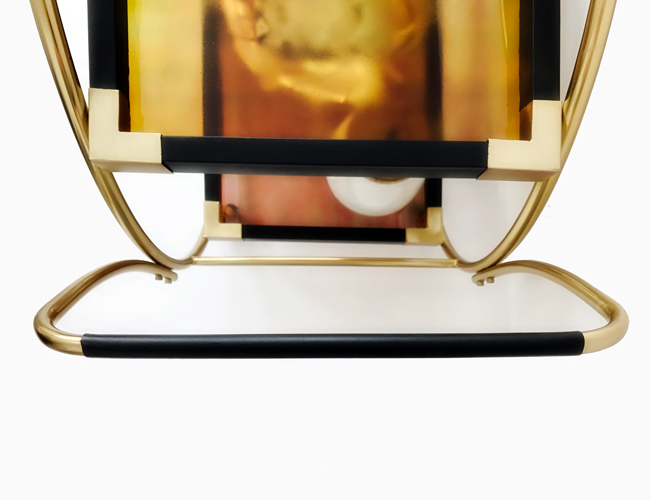 Of course it has a lot of little challenges in the rehab department, with two different shades of glass for the trays, solidly painted wood and even a bit of faux leather on the handle(bar?). I was able to reign it in and neutralize the color with just a few products, making this a simple and budget friendly revamp. 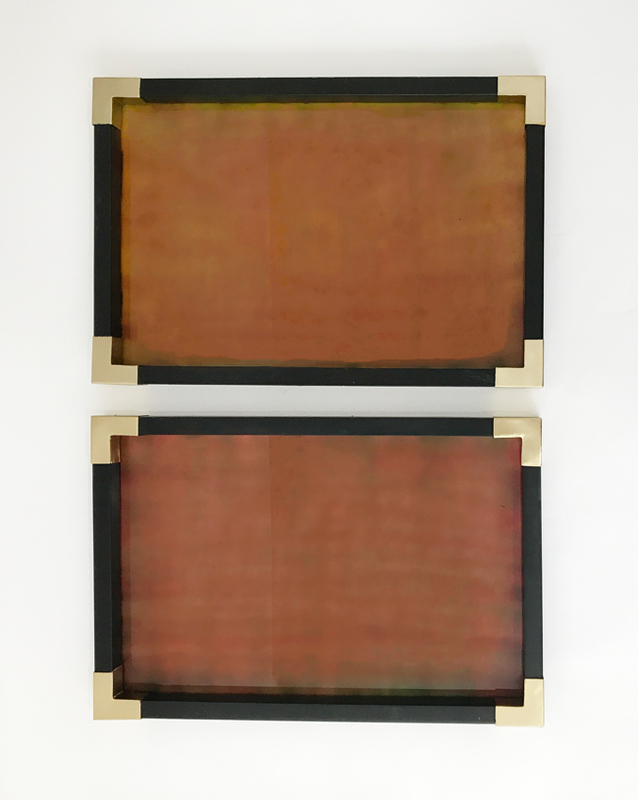 Note that both glass trays appear fairly light in the image above, but they are not. Both colors were relatively saturated and about mid-range in terms of light and dark. 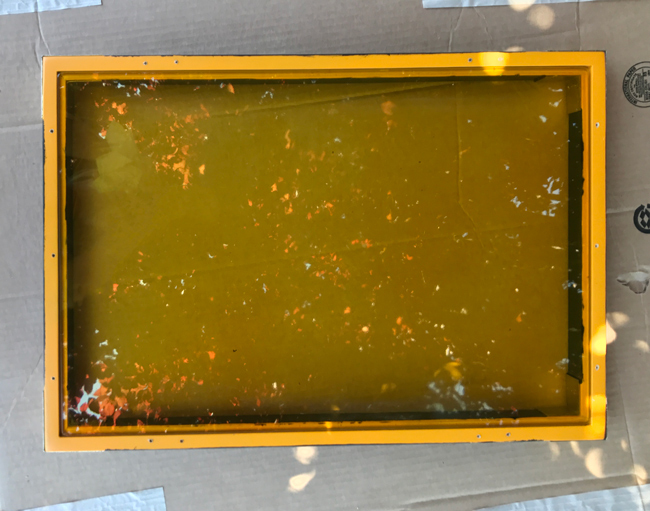 You can see this more accurately for the yellow tray, in the image below. For those of you who have ever taken any classes on color theory, you are probably aware that the best way to make a neutral color is to blend the three primary colors of red, yellow and blue. So if you are working with clear glass, you will want to purchase all three colors of stained glass spray paint and you can choose the dark blue or the light blue depending on how dark or light you prefer your neutral to be. 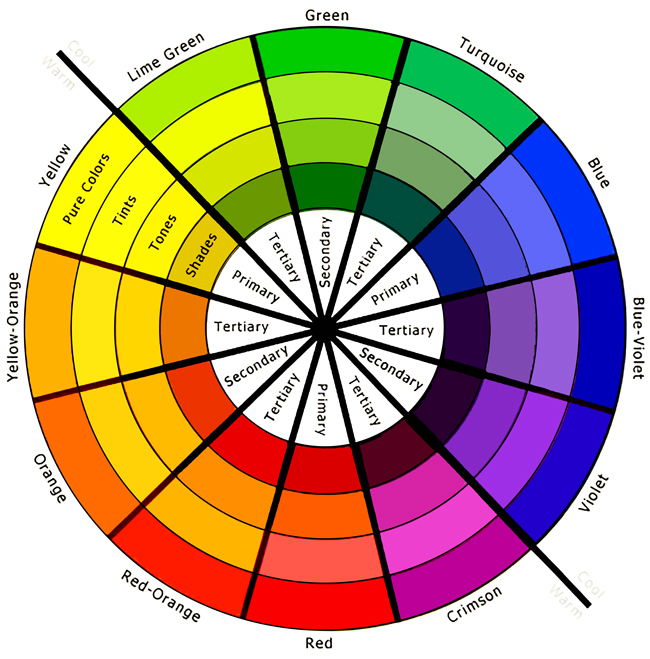 If you are attempting to alter an existing color and want to neutralize it, and you are working with a color that is a secondary color (orange, green or purple), you will simply choose the complimentary color on the color wheel (the color directly opposite from your color – blue, red or yellow). If your existing tint is a tertiary color, you will do the same as you will for the secondary colors by choosing a complimentary color – but, since you do not have the option of lime green or crimson stained glass spray paint colors to work with, you will choose both of the complimentary colors on either side of your actual complimentary color. For example, if your glass is tinted a shade of pink similar to the crimson section, instead of choosing lime green as your complimentary color you will choose both green and yellow. 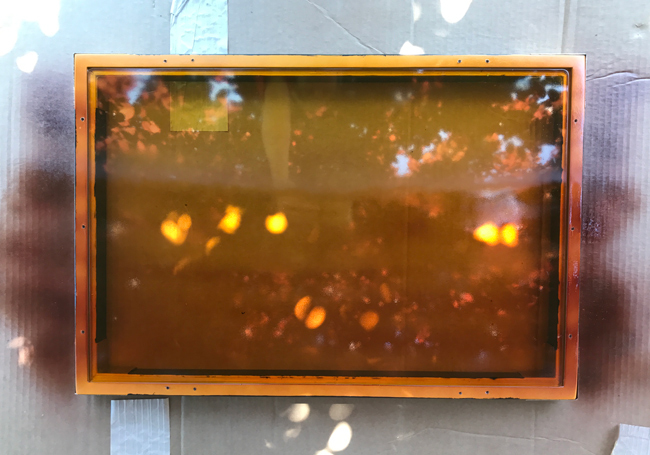 If your existing tint is red-orange, you will choose green and blue to neutralize. 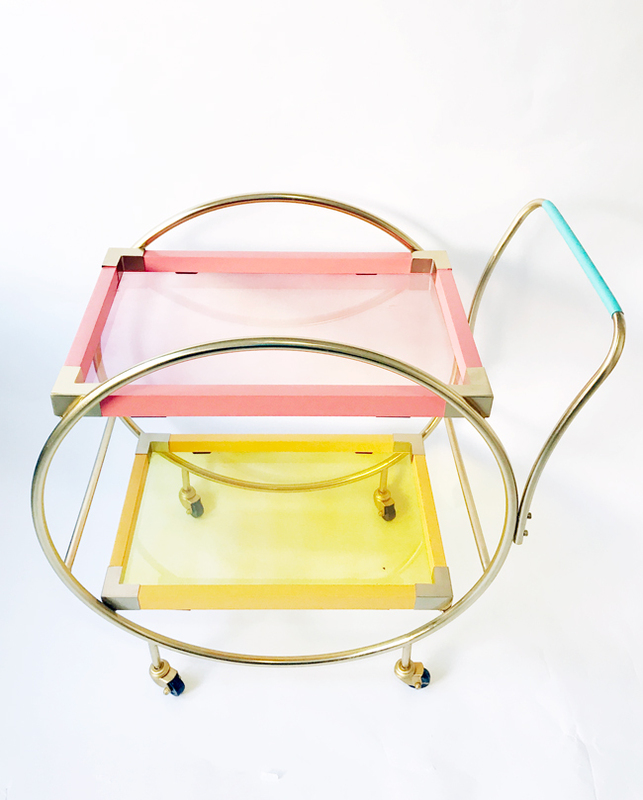 Since I am starting with one dark reddish pink tinted glass tray and one yellow, I simply need to focus on completing the trifecta for each, in the hopes of bringing them closer in shade and hue. For the yellow tray I will use the dark blue and red stained glass spray paint, and for the dark pink I will use the lighter blue and the yellow. It is important to note that you will NOT apply these color equally. Since blue and red are more dominant colors, you will always use less of those, regardless of your starting point. If you occasionally lose your mind, like I do, and you buy the yellow sea glass paint instead of the yellow stained glass paint… you can either go with the frosted look, or you can take the complementary color route as described above, just be warned it is much more difficult to do this if your complimentary color calls for green. The green color option is a very standard green color which means it is a relatively equal mix of yellow and blue – which is precisely what I mentioned you would NOT want to do in the previous paragraph. So yes, not having yellow at your disposal will likely make things tricky. When I tried to replace the sea glass for the correct product, they were out of stock, so I thought I would roll with it and see just how difficult it would be. Naturally, if I was taking that hard route for the reddish pink tray I figured I would do the same for the yellow and use the purple stained glass for it, rather than the red and dark blue. If you are using the primary colors to neutralize, start with the more dominant color and you will be spraying the bottom side of your glass. I always like to get a running start with spray paint, to work the crazy out, and then I will over spray on the sides in each direction, as I move back and forth with my paint. You will spray one very light coat of your more dominant color, running horizontally across your glass, over spraying on the sides (so you do not end up with stop and start marks) and overlapping slightly with each subsequent spray. Wait a couple of minutes and then spray one additional extremely light coat of the dominant color, in the opposite direction, or vertically. Let this dry for a few minutes and then get to work on your lighter color. You will apply this in the same way, alternating between a horizontal and vertical direction, for each coat of paint. You will have to use your best judgement as to how many layers of this second color you need, but it will likely be somewhere between six and fifteen, depending on whether it is yellow or red. Yellow will obviously require more layers than red. If you need to use a secondary color as I did here, I am happy to report that after 87 very light coats in both directions, I was successful in evening them out and neutralizing them quite a bit. They are not perfect, by any means, especially when you consider my lack of patience and the colors I was working with. But, they are both far more even in lightness to darkness and much more bronze in color. Sadly, I didn’t think to take a before shot of the trays next to each other as you see them above. That would give you a much better understanding of just how far they came and how similar they are now in comparison. As for the faux leather wrap on the handlebar, I used the same paint and foam brush, making sure to apply the paint to all areas of the texture. I applied two coats mainly to be sure I had every nook and cranny covered and it worked beautifully. The reflective quality of the leather made it difficult to capture, but I was pleasantly surprised at how well this paint worked on this type of material. It looks as if it was black all along and in no way appears to be painted. It feels fantastic as well, without having any of that painted feel. It is quite remarkable and begs for some additional testing, to see just how far one might take this… but for now, suffice to say that I am surprisingly really happy with every aspect of this makeover. I feel like both types of paint used here have a lot of potential and open a lot of finishing school doors along the road to more complicated and intricate DIY projects. You know how I like options… options is precisely what this project gave me. 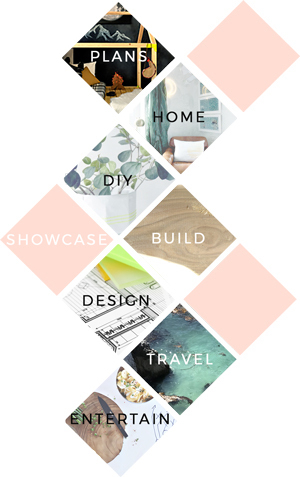 This project was created for The Design Confidential, in partnership with Michaels and my role as a Michaels Maker. With over 800 new styles of craft paint, Michaels has more paints for more surfaces! Check out some of their new finishes including ultra-metallic & watercolor and get started on your next DIY! If you want to see how the other amazing crafty folks used craft paint for their challenge projects this month, visit the Michaels’ blog, The Glue String, or browse the goodness below. Wood and black leather is one of my favourite combinations. I have a lot of it in my home!